Before stepping on the mound, junior pitcher Keven Pimentel performs his usual pre-game rituals. He makes sure to drink a lot of water, and the night before he always has chicken alfredo pasta for dinner. The 2014 High School Louisville Slugger Preseason All-American comes from a Dominican background. Baseball has always been in his family’s blood. In fact, his godfather is New York Mets infielder Jose Reyes, who Pimentel says has added to his passion for the game. As for the UT baseball team, the seven-time national champs are 7-2, and are well on their way to another Sunshine State Conference (SSC) conference title. Currently on a five game winning streak, the Spartan’s pitching staff has been lights-out. Last week, Pimentel earned SSC pitcher of the week, and is amongst the SSC leaders in wins and ERA from a starting pitcher. Pimentel recently transferred from the University of Miami, a Division I school. He spent his first two seasons there as a Hurricane and saw limited action in his first couple of years, so he decided that it was time to transfer to UT and become a Spartan. Pimentel has pitched in seventeen innings this season. He has accounted for three of the Spartans’ seven wins, a 1.06 ERA and 13 strikeouts. “Besides being an all-around great guy and fun to be around, the biggest thing with him is how he wants to be the best and how intense he gets on the mound,” Militello said. 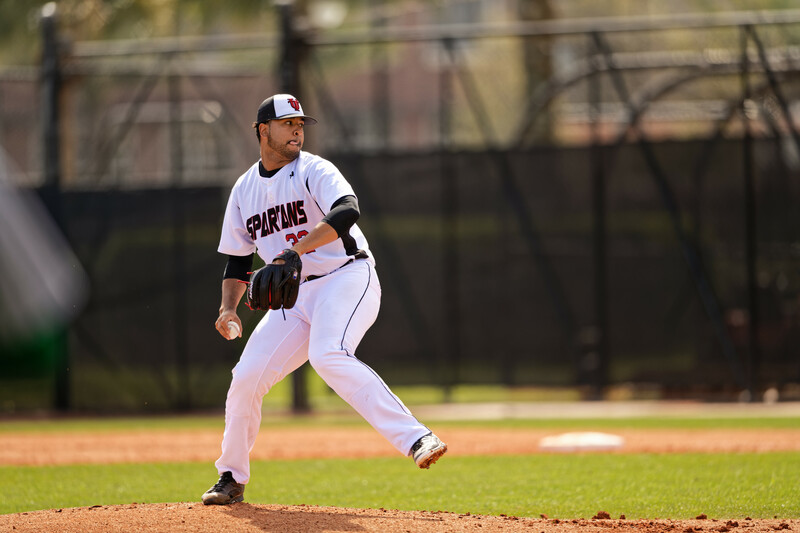 With the Spartans setting sights on yet another deep NCAA tournament run, Pimentel will play a huge part in the Spartan’s pitching staff. Transferring from one top baseball program to another, the expectations are always going to be high. “I believe this team is able to go to the World Series and win a national championship. Winning a national championship is our only goal here and is very realistic,” said Pimental. Militello has been working with Pimentel early on in the season. He admires his hard work ethic and support of his teammates. He will be a key part of the Spartans pitching staff the remainder of the year. The Spartans will take on the Philadelphia Phillies on Thursday, Feb. 22 in their annual exhibition game at 1 p.m at Spectrum Field. They will continue their quest for a National Championship this weekend in a home series against the Florida Tech Panthers.